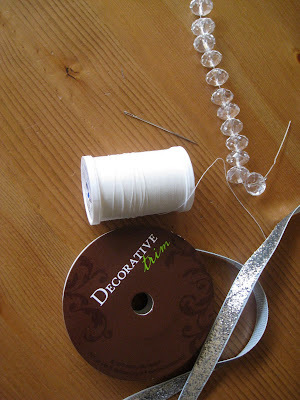 Sweet Floweret: $3 Glitzy Ribbon Necklace Tutorial-Easy! 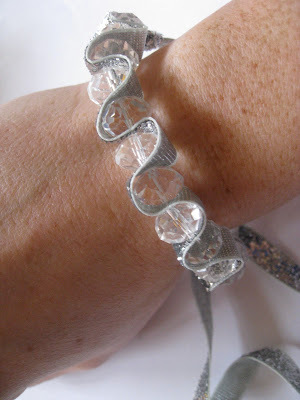 $3 Glitzy Ribbon Necklace Tutorial-Easy! Last Saturday I was at the Loft shopping for an Easter outfit. I strolled by the accessory table and saw a necklace similar to the one I made today for $35! I thought it was cute, but not THAT cute. Today I made a trip to Hobby Lobby for something unrelated to this project and thought I'd check out the bead aisle to see if they were on sale. Well, they were 50% off as was the ribbon. I spent $3 on the material to make this necklace. Over 90% less than the Loft necklace! Thread your needle and triple knot the end. I didn't cut the ribbon off the spool yet. I pulled 14 inches off the spool and tightly surrounded the crystal bead with ribbon. Thread through. Conitnue to thread through the ribbon and beads by creating a weaved pattern like you see below. You have to pull the ribbon tight against the bead each time so that the loops aren't too loose. When you get to the end, triple knot the thread. I went through the beads with needle and thread in the opposite direction so it would be stronger. Once you get back to the other side, tie off the thread and trim the thread from both ends. Knot the ribbon as closely as you can to the beads on each end. Cut your ribbon off of the spool so that the sides are even. As a necklace... Just tie the ribbon at the back of your neck. You can make it as long or short as you'd like! Not too bad for $3. If I were to make it again, I think I'd skip the glitter ribbon. It's a little itchy on my neck ;) For $2 more, you could add another 12 beads. Cute! It always feels good to make something for so much less! Very pretty, and a great way to dress up a strand of beads. Really cute and trendy! I love inexpensive and quick projects!